Is your Voter ID acceptable? 11% of voting-age U.S. citizens don't have a current government-issued photo ID. That's roughly 25 million voters in 34 states who don't have an acceptable Voter ID. Many people don't realize that in many states, they need both to be registered and to have a valid voter ID in order to vote. Fortunately there's help. 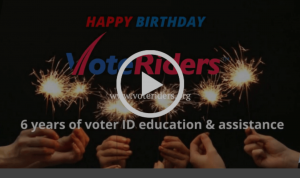 VoteRiders is a non-partisan, non-profit organization dedicated to helping citizens obtain voter IDs to exercise their fundamental right to vote. Kathleen Unger founded VoteRiders in 2012 after realizing that millions of potential voters could be disenfranchised by the increasing number of stringent voter ID laws. Its goal is to ensure that no voter is prevented from voting because of a lack of ID, nor deterred from voting because of a lack of confidence. Every voter and every vote is important. VoteRiders provides voter ID resources and support to other groups, to local volunteers, and to communities to educate and assist voters. DemLabs is a progressive non-profit hub for innovation and information inter-change. We search for existing, innovative solutions to meet campaign needs, rather than develop new software. We look for affordable, easy to use apps that have been tested and proven effective in business. Helps us evaluate more apps and support more groups by donating here. Thank you!